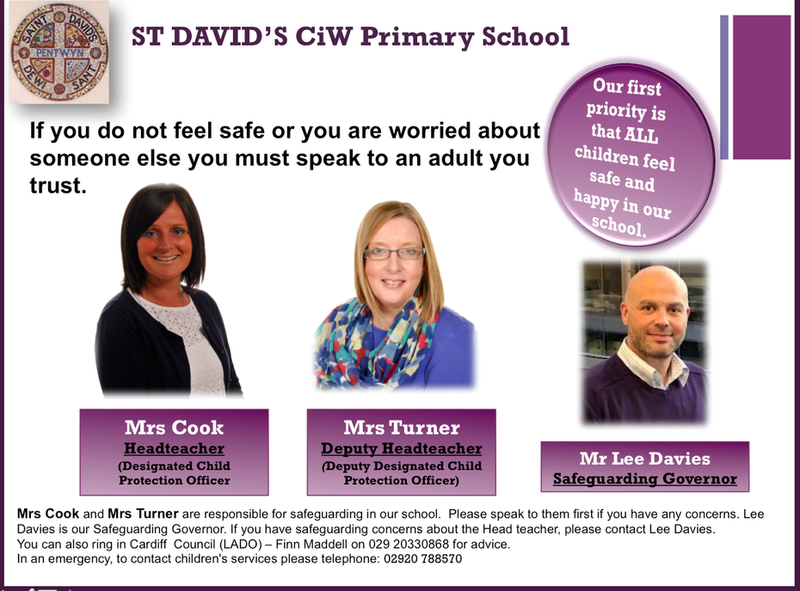 At St David's CiW Primary School, we have separate policies within which, we aim to address many of the above areas. We have a Health & Safety Policy that addresses many of the areas including security, pupil welfare and educational visits; we also have a separate Anti Bullying Policy, Racial Equality Policy and eSafety Policy - these can be found on the policies page. Please click on the link to download and read a copy of our 'safeguarding' policy. In school, our designated safeguarding person are Mrs Cook ( Headteacher) and Mrs Turner (Deputy Headteacher). The poster below has been designed to help you and is displayed around the school.